Blue House (Chinese: 藍屋) refers to a 4-storey balcony-type tenement block located at 72-74A Stone Nullah Lane, Wan Chai, Hong Kong, China. It is named after the blue colour painted on its external walls. It is one of the few remaining examples of tong lau of the balcony type in Hong Kong and is listed as Grade I historic building. The building was the original site of the first hospital 'Wah To Hospital' (aka "Wan Chai Kai Fong Hospital"), which was built in the 1870s in Wan Chai. The hospital, which provided Chinese medical services to local Chinese, was possibly the first hospital in the district. After the hospital closed in 1886, the two-storey building was then used as a temple for Wah To (Pinyin: Hua Tuo), the revered Chinese physician from the Three Kingdoms period. The building was demolished in 1920 and was built into four four-storey tenement blocks in 1922. 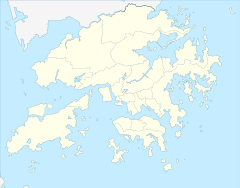 After the Japanese occupation of Hong Kong in 1945. The building was subsequently used as a martial arts school and Dit Da clinic by Lam Cho, the adopted nephew of Lam Sai-wing. All the upper floors of Blue House, apart from 72 Stone Nullah Lane, are timber structures. The two wooden stairs, with original elements intact, are well maintained. The building was part of a HK$100 million plan, unveiled by the Housing Society and the Urban Renewal Authority, to preserve nine Chinese-style buildings in Wan Chai that were constructed during the 1920s. The building has been preserved and revitalised in a traditional tea and medicine style. In 2007, the Urban Renewal Authority and the Development Bureau jointly announced that the residents of the Blue House, were to be allowed to stay in this historic monument. On the same year, one of the ground floor's shophouses of the building was occupied as a location of the Wan Chai Livelihood Place, which was later renamed as the Hong Kong House of Stories in March 2012. The building closed for renovation in 2015. The building was fully renovated and opened in 2016. It won the 2017/2018 architectural prize in 2018. ^ "活化不失原有建築物風格 We嘩藍屋奪獎". on.cc東網 (in Chinese). Retrieved 5 April 2019. 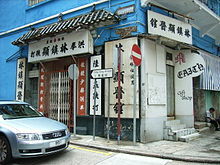 Wikimedia Commons has media related to Blue House, Hong Kong. Preliminary Study on "Blue House"
This page was last edited on 23 April 2019, at 03:15 (UTC).